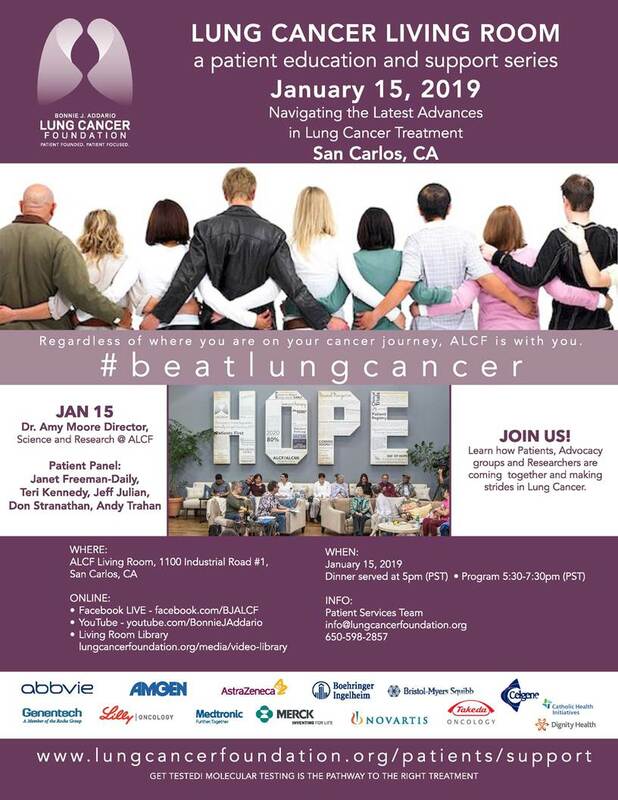 Please join lung cancer patients/survivors Teri Kennedy, Jeff Julian, Don Stranathan, Andy Trahan, and me, along with Dr. Amy Moore (Director of Science and Research, Bonnie J. Addario Lung Cancer Foundation, also know as ALCF) Tuesday January 15, 2019 5:30-7:30 pm Pacific Time for a discussion on “Navigating the Latest Advances in Lung Cancer Treatment.” I’ll have an opportunity to talk about The ROS1ders and the research project we created in partnership with ALCF. Join us in person in San Carlos, California, watch live on Facebook, or watch later on YouTube or in the Living Room Library. This entry was posted in Advocacy, Clinical Trial, Lung Cancer, Patient Advocacy, Patient-Driven Research, Precision Medicine, Research, ROS1 Cancer. Bookmark the permalink. It’s the 15th, right? Not the 16th? Yes! Thanks for the catch.